Each frame is .13 seconds apart. Grant Hackett's time for the event was 3:43.15. This sequence shows the deliberate execution of a six-beat kick. The swimmer is wearing a fitted Speedo LZR Racer swimsuit. It readily can be seen that the suit still creates turbulence, particularly on the anterior abdomen. Frame #1: The left arm has entered while the right arm is in a position of maximum propulsion, that is, the propulsive surface is the total arm plus the hand. This "overlap" is typical of tall swimmers in distance races because the time to complete a recovery action is much less than that required to complete the underwater action. The recovered arm is being "parked" in front of the swimmer. The right leg has kicked to counterbalance the right arm entry. The right hip is lower than the left hip. Considerable turbulence is created by the face looking mostly forward as it begins to turn to facilitate breathing. The swimmer is aligned straight down the central horizontal axis. Frame #2: The entered arm hyperextends and "locks" at the elbow (possibly an unnecessary and likely learned action). The right arm propulsion is nearing its limit of effect. The upper arm has adducted markedly since the previous frame. The head is turning to the right to breathe. The shoulders are rotating in concert with the head movement. The hips are rolling to dip on the left to allow the hand to exit straight back and up without have to negotiate around a flat hip. The straight body alignment in the swimmer's streamline is maintained here as it is throughout the total stroke. Frame #3: The left arm "unlocks" (perhaps justifying the irrelevancy of the hyper-extension shown in the previous frame) as a preparatory action to developing propulsion. The right upper arm has exited requiring the left leg to kick to counterbalance the vertical forces created by the exiting arm. The head has turned to breathe accompanied by the shoulders rotating further. Frame #4: The left arm presses down and outward to counterbalance the exited arm and the extreme rotation of the shoulders. The shoulders appear to have rotated ~90°, which is excessive and unnecessary. The head has turned well past horizontal suggesting too much rotation is associated with breathing. It also seems that inhalation has occurred at this time, which is too late. Ideally, inhalation should occur outside the effort phase of any high-effort movement, that is, as the arm exits the water (after propulsion and before it is well above the water in recovery). In addition, inhalation should be positioned low in the bow-wave rather than over the water as occurs in this frame. 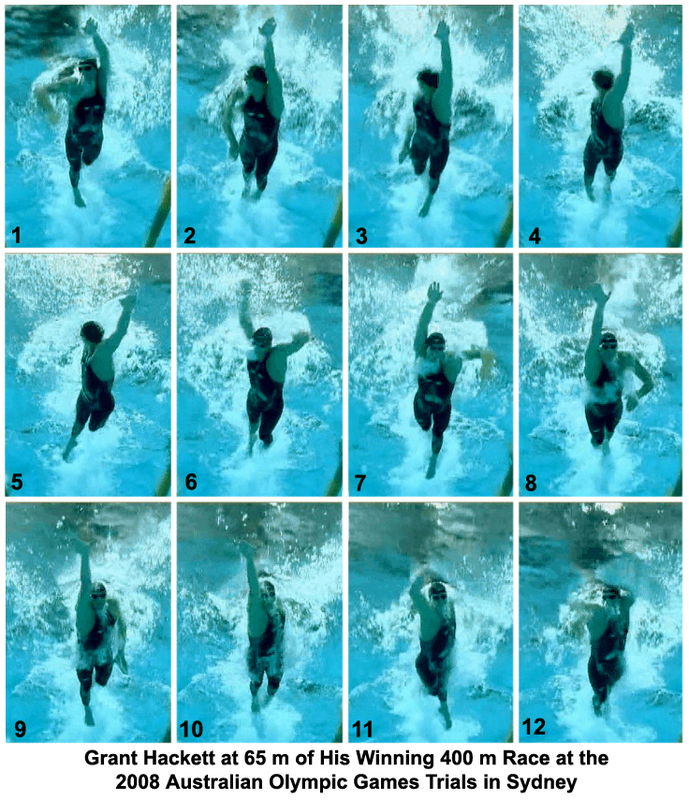 At this time, no propulsion is being produced (the left hand is oriented ~45° to the side) causing the swimmer to slow. Frame #5: The left arm continues to press down as the right foot has finished its kick. It is difficult to tell if the kick counterbalances the arm-press or the arm-press counterbalances the kick. Another alternative is that both actions counterbalance the recovering arm, which is at the peak of its movement path. There are many things happening at this stage of the stroke but unfortunately, none has a propulsive function. Turbulence can be seen streaming off the back of the left hand, but it is mainly vertical. The head begins to turn but is still oriented upward [ideally, it would have been returned by this stage of the stroke]. The forceful six-beat kick prevents the hips from turning any more although they still appear to be at ~45°. Almost a quarter of a second has passed since propulsive forces were developed – the result being significant reductions in forward momentum (the swimmer slows due to an inertial lag). Frame #6: The left arm rapidly changes to a propulsive action. The upper arm abducts and the hand travels much faster than the elbow. Considerable drag forces are being generated by the left arm, which can be seen clearly by the white trail of turbulent water coming off the back of the hand. The right arm approaches entry. The head is returning with such vigor (it had a considerable range of motion to complete) that a large amount of turbulence is created and streams off the face. The hips are rotating back toward a flat position. Frame #7: The total left arm is providing propulsive forces as the right arm enters. The head has finished turning and the extent of its turbulent stream is visible. The left leg kick counterbalances the vertical forces of the right arm entry. The hips and shoulders are flat. The body position puts the pulling arm to the side of the swimmer, rather than desirably under him. Some corrective actions are required to offset the lateral forces of the arm. One is the position of the left foot which has crossed the center line of the body. It is possible that the right leg's preparatory position has also placed the foot across that line. The hand entry has crossed the center line, although only marginally. If counterbalancing actions did not occur to offset the left arm position, the swimmer would swerve. Frame #8: Adduction of the left upper arm continues to produce propulsive forces off the arm (obvious turbulence comes off the left hand). The right arm stretches and crosses back over the center line as it stretches forward. The extent of the created head turbulence is obvious as eddies left swirling in the water appear as milky water across the swimmer's abdomen. The head position still produces turbulence off the chin (it looks like a white beard). Frame #9: The left arm finishes propulsion and the right arm hyperextends forward. The right leg kicks possibly to counterbalance the developing vertical forces off the exiting left arm and the rolling of the shoulders and hips. Turbulence continues off the head. Frame #10: The swimmer again experiences an inertial lag as no propulsive forces occur. The elbow remains hyperextended as the hand presses downward. The shoulders do not rotate as much as when a breath is taken (see Frame #4). The hips roll. Frame #11: The right arm begins to develop propulsive forces but also lateral forces as the arm moves to the side. The positions of the legs crossing the center line and the left leg kick show the reactions within the swimmer to the lateral arm action. Frame #12: The right arm continues to move outward and backward one stage before attaining the position exhibited in Frame #1. Several important changes need to be made to Grant Hackett's technique for him to improve his race performances to any marked degree. Minimize the turbulence off the head, the negative effects of which would be significant over 400 and 1,500 m racing distances. Breathing to the side in the bow wave and carrying the face profile at least horizontally would be two changes to start with. The head position produces turbulence off the chin. If the swimmer looked directly at the pool bottom as well as rotating slightly to the side away from the pulling arm, the drag forces created by that non-propulsive part of the anatomy would be reduced. Given the exhibited amount of turbulence generated in this sequence, much tinkering with the head action is warranted. A change in the head action would have the potential to reduce drag to a far greater degree than would any "super" swimsuit. Since hyperextension forward occurred with both arms, it is likely that this is a learned but unnecessary action. Perhaps too much emphasis has been placed on stroke length forward rather than quickly initiating propulsion to reduce changes in momentum. Elimination of the hyperextension arm actions is warranted. Excessive shoulder roll also creates turbulence that slows the swimmer. It also places the swimmer into unproductive positions. Having the shoulders rotate through 180° is one of the greatest ranges of motion recorded by this writer. Inertial lags are too great for a distance swimmer. Their elimination would produce quantum improvements in race performances since they consume almost a half second per full stroke cycle in this swimmer.